It’s official. Summer is almost over so what better time to celebrate an awesome summer and the upcoming school year by throwing one more fun bash, like an ice cream party with homemade ice cream cookie sandwiches! With fun tools like the Curious Chef Ice Cream Set Gift Bundle, complete with an easy-to-grip scoop and fun colored ice cream bowls, kids can have fun by not only devouring the sweet snacks but, preparing them too! Curious Chef inspires a love for cooking in kids by providing fun, safe, and easy-to-use kitchen tools for kids ages four and up. I love that all their products are small enough for small hands but look like their full size coutnerparts so kids feel BIG making foods just like mommy or daddy! This summer my kids have been enjoying the Ice Cream Set Gift Bundle ($12.99). Scoop and serve yummy ice cream with your little chef using the Ice Cream Set Gift Bundle. 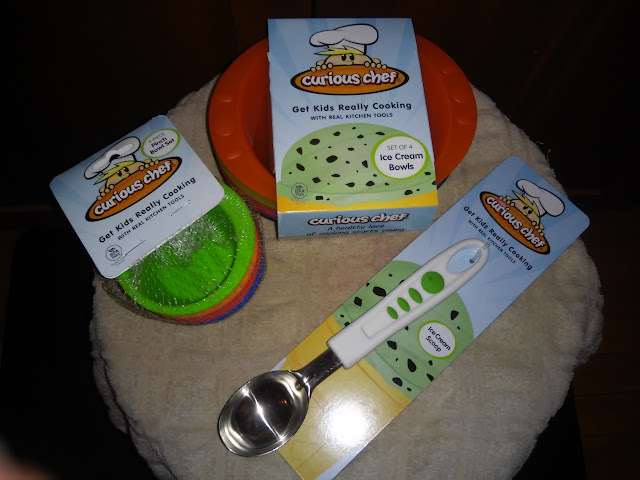 The Curious Chef® Ice Cream Set Gift Bundle screams family fun. Scoop out, dish up and top off your favorite flavors with the help of the Curious Chef® Ice Cream Scoop, Set of 4 Ice Cream Bowls and 4-Piece Silicone Pinch Bowl Set. Your child will love scooping up their favorite flavors using the easy to grasp ice cream scoop. The child friendly handle features soft touch grips for a firm hold. Serve it up in one of the brightly colored (red, green, blue and orange) easy-to-grasp ice cream bowls. And colorful (red, blue, green, orange) silicone pinch bowls are the perfect place to store sprinkles, nuts and other delicious toppings. This is the perfect bundle for family fun! And with Fall on its way quickly, we will start baking yummy, warm goodies around our house! My kids will definitely be helping me and using their Baking Set Gift Bundle ($12.99) from Curious Chef! The Curious Chef® Baking Set Gift Bundle is the perfect set of kids cooking utensils for your budding baker. This fun gift bundle includes a Nylon Cookie Turner, Nylon Frosting Spreader and the always popular Curious Chef® Non-Stick Rolling Pin. Each of these uniquely designed kids cooking tools are created with kid-friendly ergonomic handles featuring soft-touch button grips. 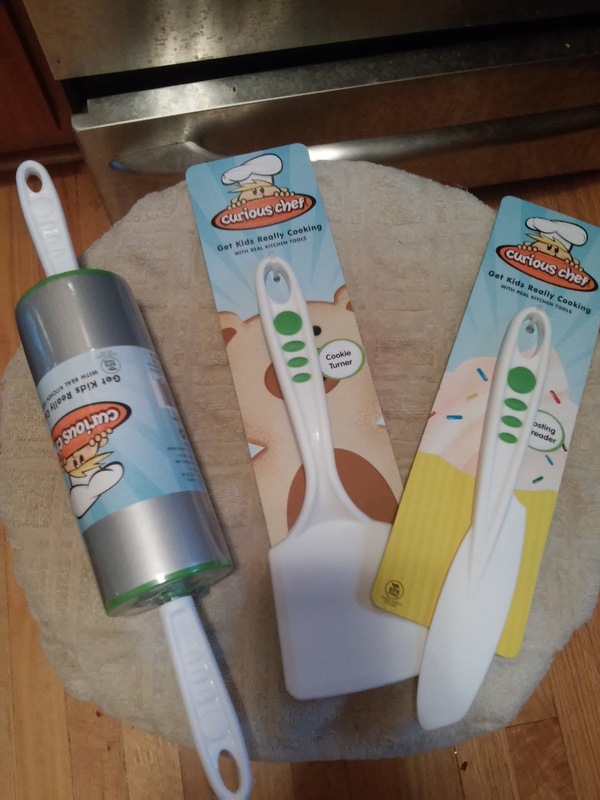 The nylon cookie turner features a large surface area so your child can safely join in on the cookie baking fun, while the nylon frosting spreader has an angled tip for a smooth and seamless finish. The Curious Chef® Non-Stick Rolling Pin is a favorite tool for cooking with kids. It includes a slightly weighted design and non-stick surface. Enjoy family baking cooking time with the Curious Chef® Baking Set Gift Bundle. Spend some quality time with your children baking, making and creating in the kitchen with the fun, colorful and awesome children's cooking tools from Curious Chef! Children will love helping and using cooking tools just like you use! You can purchase all Curious Chef tools from the Curious Chef website.